The tradition of the engagement ring has evolved, no question. In Roman times, it symbolized ownership of the bride-to-be. The first person to commission a diamond ring for his betrothed was in fifteenth century Austria. Today, the smitten diamond ring shopper is working with more tools in his toolbox. “The Internet and Pinterest have made ring shopping considerably easier,” said Jennifer Lance of Heritage Fine Jewelry in Shelter Cove Towne Centre on Hilton Head Island, a family-owned and operated business started by her mother in 1975. “A lot of times, people will come in with a picture.” The days of trying to match the dream, often provided secondhand by a best friend or sister, with the reality of hundreds of settings and diamonds, are nearly gone. Referred to as the four C’s, these designations are: Cut – the more precise the cut, the more beguiling the stone; Color – a scale ranging from colorless (the most-rare), to light yellow, or light brown; Clarity – blemishes in the diamond are rated; and Carat – the diamond’s physical weight. When purchasing a diamond from Heritage Fine Jewelers, the certificate that goes along with that stone includes two additional designations: polish and symmetry. “You’re not going to have a high-quality stone that’s not well-polished,” Lance said. And the cut of that stone is going to have nearly perfect symmetry. The team also provides cleaning and checking of the piece for free, forever. They write appraisals and are nearby to make repairs and provide free sizing on the premises. In most cases, the ring will be fitted within a day of the proposal. It may be Mother Nature or maybe it’s magic, however, nothing can replace seeing and touching a stone before buying it. “You can show somebody two stones that are identical as far as the color, the clarity, the cut grade, everything,” Lance said. “And for some reason, one stone really just stands out. There’s no scientific term for that.” It’s a phenomenon seen regularly at Heritage Fine Jewelry, and when buying a diamond, an experience not to be missed. Heritage Fine Jewelry is located at 28 Shelter Cove Lane, Suite 114, Hilton Head Island. 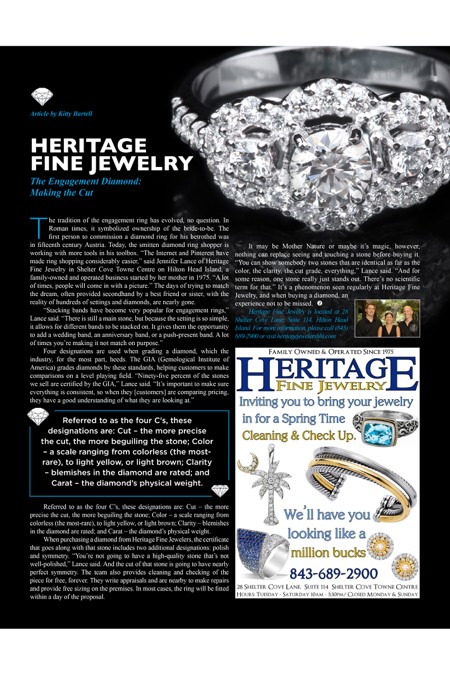 For more information, please call (843) 689-2900 or visit heritagejewelershhi.com.